Bright, vibrant and exciting glow in the dark and flashing novelties hold great appeal to adults and children alike which makes them fantastic for sale at fundraising events. 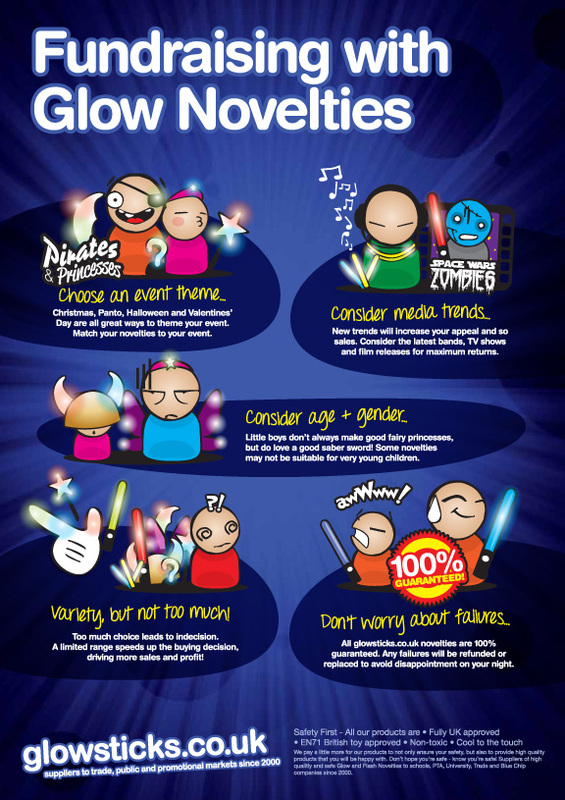 Relatively inexpensive to buy and with brilliant margins for profit, the sale of glowsticks and flashing novelties can easily make the difference between a good night and a hugely successful one. So how do you get the best possible returns on your investment? The school calendar presents many an opportunity for fundraising. 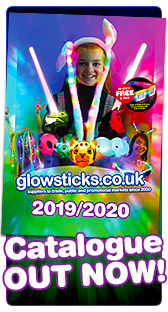 Think Christmas, Valentine’s Day, Easter, Leavers proms, Halloween, Bonfire Night; the list is endless and all with the potential to sell glow and flashing novelties. 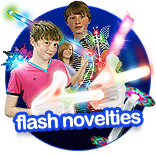 Theme your novelties to the event so that they’re relevant for a better uptake, for example; flashing Santa Hats at Christmas, hearts and fairy wings on Valentine’s Day, devil horns and skull swords at Halloween, Bonfire Night may want to replicate colourful fireworks with mini spinners, rainbow windmills and heli headlights. Star Wars has never really gone away as a media trend, whilst vampires, wizards and magical creatures are trending more often with the release of films such as The Hobbit and the Harry Potter franchise. Princesses always feature well; especially now that the Royal Family are back in vogue thanks to Kate, William and Harry and of course the new prince and Disney resurrects a new princess story once every few years keeping them eternally in the hearts of young girls. 3. Consider the age and gender of your audience. Past the age of three, no little boy will want to be seen with a fluffy pink wand, but will love to challenge his friends with a cool light sabre sword. If you’re worried about smaller children hurting themselves or each other, flashing foam sticks are a fabulous alternative to swords for younger kids and are equally as popular (if not more so with parents). Little girls tend to be drawn towards wands, wings and head boppers, although great unisex choices such as mini spinners will entertain kids of all ages. 4. Offer a varied choice…but not too much choice! Whatever you choose for your range try not to offer too many similar items, only offer one kind of sword, one kind of wand or one form of head wear etc…, too many choices along similar lines will ultimately leave you with unsold stock and cut into your margins, that said don’t worry if you have any bits and pieces of stock left over, all glow products have a two year shelf life and flash novelty batteries will hold for up to twelve months. 5. Don’t worry about failures. 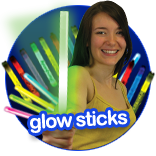 All Glowsticks.co.uk glow and flashing novelties are 100% guaranteed and so if you experience any problems with your products, simply let us know and we will endeavour to replace or refund them, which take all the risk out of buying for you.